Millions of us use our Apple devices to listen to music every day — through earbuds or headphones. Millions of us use our Apple devices to listen to music every day — through earbuds or headphones. But lots of home theater receivers and in-dash car stereos include a "made for iPod/iPhone/iPad" USB input that lets you move your music beyond your head and into your car or living room. All you need to make it happen is the right cable. 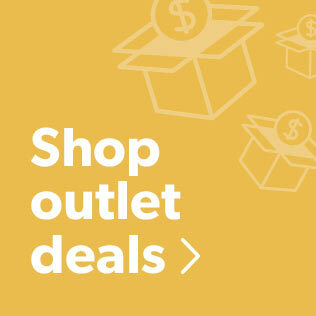 If you own an Apple device with the Lightning™ dock connector, AudioQuest's Cinnamon adapter cable is an outstanding high-quality cable choice. 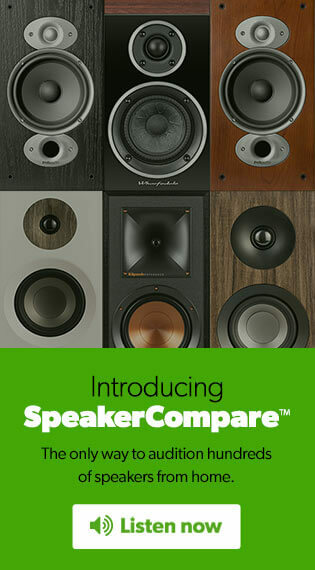 With Cinnamon, music sounds noticeably clearer and more detailed than with the standard cables we've tried. 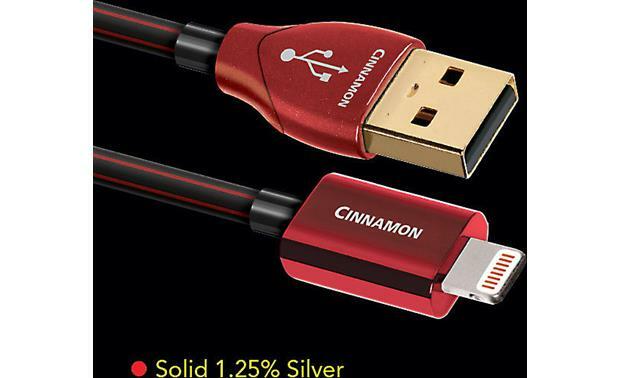 Cinnamon USB uses solid copper conductors, and each wire is silver-plated — the silver layer is a bit thicker than on AQ's Forest cable — which benefits high-frequency applications like audio. Signals at these frequencies travel almost exclusively on the surface of the conductor. Because the surface of each conductor is made of high-purity silver, the cable's performance is close to that of a solid silver cable, but priced much closer to a solid copper cable. Any solid material adjacent to a conductor actually becomes part of an imperfect circuit. Wire insulation absorbs energy (loss), and some of this energy is stored and then later released as distortion. Cinnamon USB uses air-filled foamed-polyethylene insulation to minimize this type of distortion. 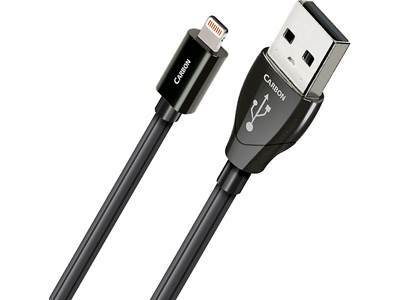 Apple Lightning to USB Cable: AudioQuest specially designed the Cinnamon series Apple Lightning to USB cable for select Apple devices with a Lightning-connector. This Apple Lightning to USB cable charges and syncs your Apple device when used with an appropriate charger (sold separately) or when connected to your computer/laptop. 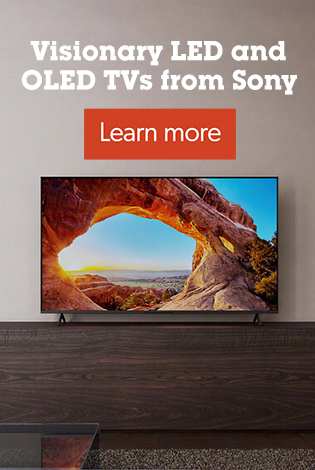 Also, use it to connect your compatible Apple device to a home audio or car stereo component which feature's a "made for iPod/iPhone/iPad" USB port for high-quality audio playback. It's the perfect high-performance cable for your Lightning-connector Apple device. The cable is compatible with the following iPods, iPhones, and iPads with Lightning-connector (as of 5/28/2014). Note: Not compatible with Apple iPod, iPhone, and iPad devices with the older 30-pin dock connector. 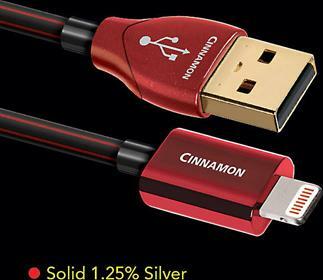 High Quality Construction: AudioQuest's Cinnamon series Apple Lightning to USB cable minimizes distortion (primarily timing errors) by incorporating a variety of proven design techniques, superior materials, and high-precision construction. Solid 1.25% Silver Conductors: Solid conductors eliminate strand-interaction distortion and reduce jitter. Solid silver-plated conductors are excellent for very high-frequency applications, like USB audio. These signals, being such a high frequency, travel almost exclusively on the surface of the conductor. As the surface is made of high-purity silver, the performance is very close to that of a solid silver cable, but priced much closer to solid copper cable. Foamed-Polyethylene Insulation: The Apple Series Cinnamon cable uses air-filled Foamed-Polyethylene Insulation because air absorbs next to no energy and Polyethylene is low-loss and has a benign distortion profile. Thanks to all the air in Foamed-PE, it causes much less of the out-of-focus effect common to other materials. AQ Solder Terminations: Precision direct-silver plated pins are carefully attached with the very best solder. Through choice of flux and metallurgy, AQ solder has been optimized to make a low-distortion connection. 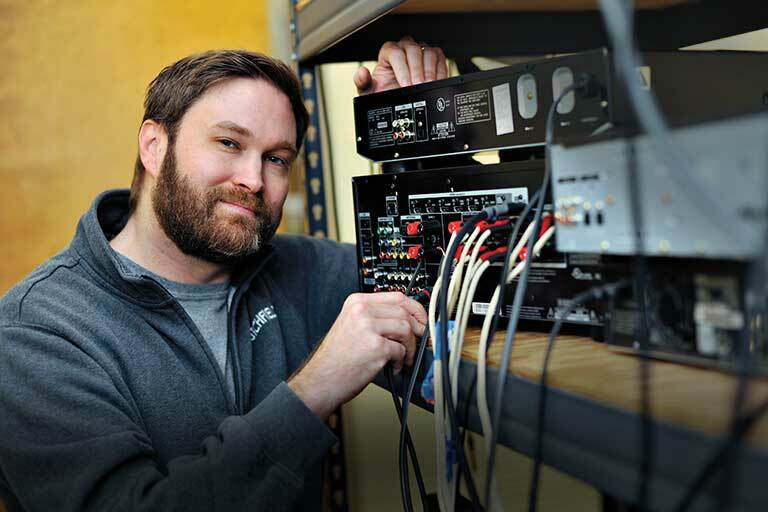 The difference you hear between solders is a result of connection quality. AQ Solder does not have a high silver content because the more silver there is in solder, the more difficult it is to make a good connection. 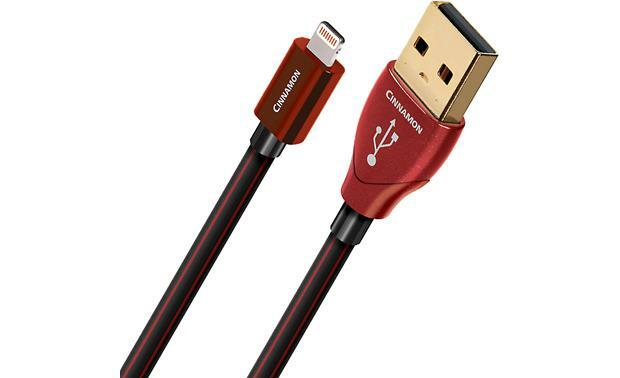 What is the wire size, data and charging in the audioquest cinnamon lightning to usb cable? Get a cable with thicker silver plating on the conductors, and superior noise shielding. Searches related to the AudioQuest Cinnamon Lightning-to-USB cable for iPod®/iPhone®/iPad®.